the industry to discuss hot topics in orthopaedic research, trauma and sports injuries. networking opportunities that are essential to you our Industry Partners. a unique and high-quality scientific programme to our expected 1,000 delegates. first edition of the ESSKA Speciality Days 2019.
meeting for Industry Stakeholders to establish new partnerships. across 1,500 m² gross space. 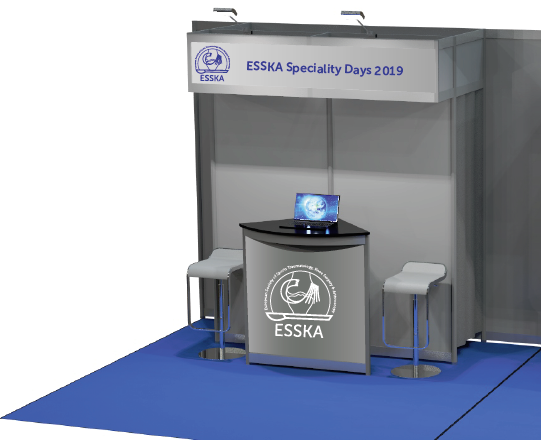 To request the Sponsorship Prospectus for the ESSKA Speciality Days 2019 and to discuss options and fees, please contact Mr. Rik Bollaert at bollaert.rik@esska.org. • Meet the Right People – Engage with over 1,000 decision makers in our Exhibition Area. promote your offering to your target audience and build your brand. representatives from more than 50 countries. • Possibility to choose an exclusive or tailored package sponsorship opportunity. • Benefit from applying within the Priority Application Deadline before 15 September 2018.
WHO SHOULD SPONSOR OR EXHIBIT AT ESSKA SPECIALITY DAYS 2019?